Last year, we visited an old town of Hoi An in Vietnam which was listed as one of the world heritages by UNESCO. This year, we came to Hue, another Vietnam’s old town which was also put on the list. To reach Hue, we had to take a night flight from Hanoi. Arriving at Phu Bai airport at night, we were picked up with a rented car that we had reserved few days earlier from the hotel we were going to stay. We were a bit surprised as our driver, sorry I forgot his name, spoke English in a very clear and easy–to–catch accent, not like any other Vietnamese we had met. Turned out he had been working in tourism industry for like ten years. That night, we stayed at Cherish Hotel, located on the street named Ben Nghe. 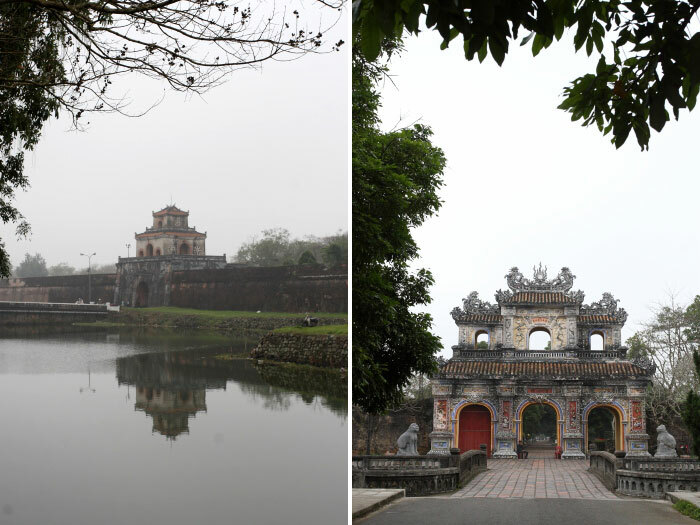 The following morning, relying on google maps, we walked to the major attraction of Hue, which was the 19th century vast citadel where the Nguyen Dynasty Emperors sat and ruled Vietnam. That day, I learned that Hue was actually the former national capital of Vietnam from 1802 to 1945. 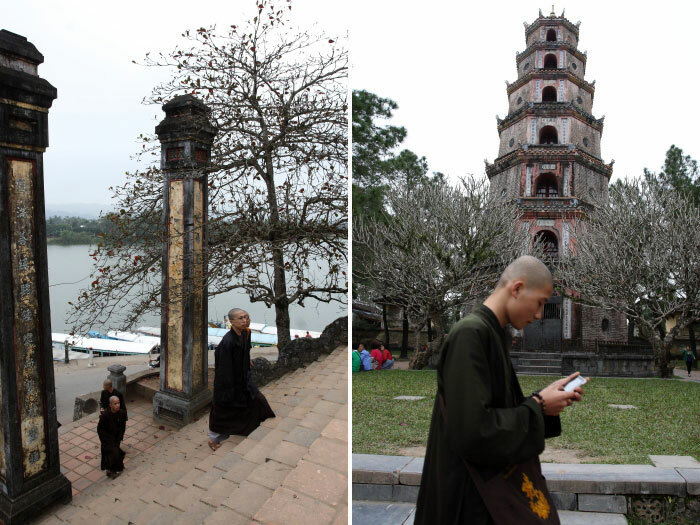 Geographically, Hue is located in the centre of Vietnam and is bisected by a huge river named Perfume River. When the country was divided into North and South, the river became a physical border between the two. 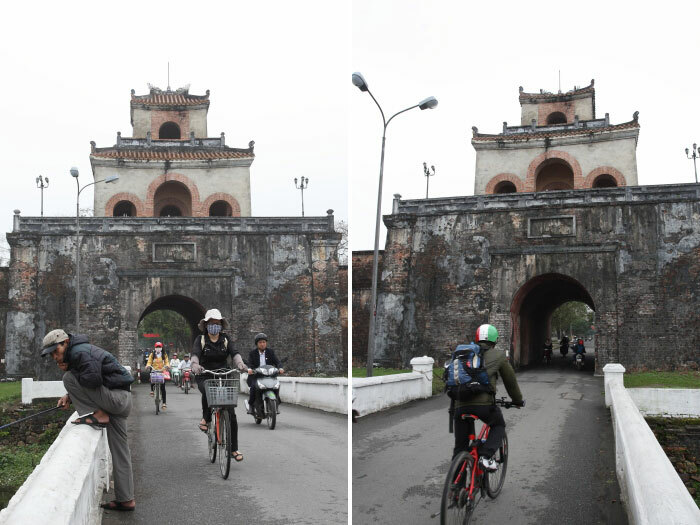 To reach the citadel, we had to cross the Truong Tien bridge spanning across the Perfume River. It’s a very historical bridge for today’s Vietnam. Built in 1897 by French colonial government, the bridge was designed by Gustav Eiffel, the same guy who designed the Eiffel tower in Paris. Despite its grand and highly engineered structure, the bridge had been collapsed for several times due to natural disaster and mostly, conflicts. It was first built with woods as its surface. In 1906, the woods were replaced with reinforced concrete after a big storm destroyed it 1904. In 1937, the bridge was expanded for bicycles and pedestrians. In 1946, during the Vietnam – France War, part of the bridge was collapsed due to mine explosion. Repaired in 1953, the bridge, again, was collapsed in 1968 during the Vietnam – American War. The Vietcong, under the cover of the night, dove in the Perfume River carrying explosive bomb, blew out the bridge. It was tragic however that in that year, millions of refugees from the north desperately walked across the collapsed bridge to the south to escape the communist Vietcong who invaded Hue from the north. As for the vast citadel, it is located in the north, and our hotel was in the south. That morning I paused for a second on that bridge just to watch some cruising boats loaded with tourists on the Perfume River. 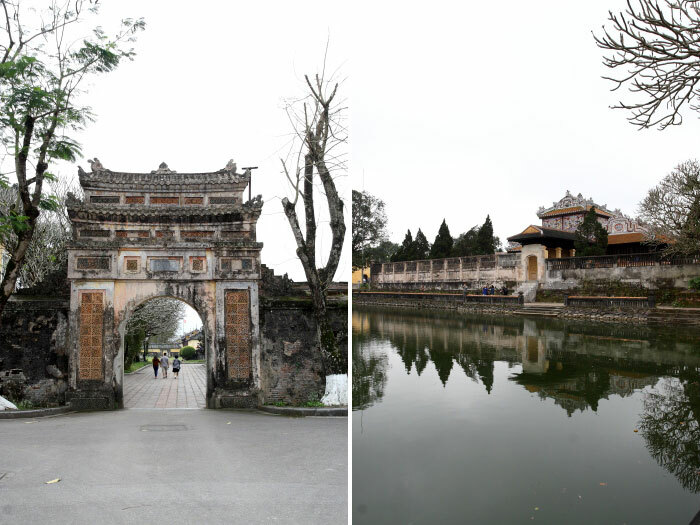 Like many ancient citadels, the one in Hue was also surrounded with moats. It’s good news that the moats still exist until today. It’s not so good news that some areas inside the wall of the citadel is occupied by the locals for a settlement. We had to cross a bridge over the moat to reach the entrance gate of the citadel. Like the old gate we had seen on the other in Hanoi, there was some watch tower above the gate. That’s the place for the guards to control anyone coming in and out the citadel which to me, was more like a small town inside the walls. After passing through the outer wall, we walked toward the palace complex which was protected by inner walls. Of course we had to pass through another gate to get inside the complex. The entrance gate open for tourists was the one facing the Perfume River in the south with a huge flag pole in front of it. The vast plaza between the huge flag pole and the main entrance gate made me feel like being in the forbidden city in Beijing, China. We were soon immersed in the old palace complex where the Nguyen Dynasti ruled the country for almost one and a half centuries. Most buildings were preserved in their real conditions. Until now we could still see the ruins of some structures inside this complex. 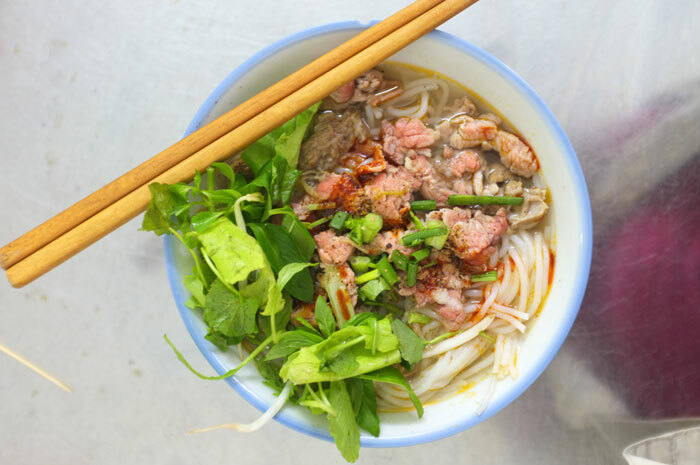 They were severely damaged by the war in 1968, when the US army and marine were involved in a brutal battle with Vietcong right on the Tet day, the Vietnamese New Year. The battle had claimed many historical sites and artifacts inside this complex. Some of them had been successfully restored and reconstructed, and some were still left and abandoned. It was obvious to me that the royals lived a lavish life. They built grand French style theatre hall, mansion, and went to French universities. They also built a huge bath surrounded with parks. Shortly after noon, we came out from the palace complex through another gate. Our next destination would be Thien Mu Pagoda. We had no idea how to reach that place. Hue was just a small town. The only transportation we could rely on was taxi. The hotel we stayed had recommended us few names of taxi company in this town. Soon as we found a cab parked not far from the inner gate, we headed to the pagoda. The route was pretty simple. We just had to drive along the Perfume River heading the west. The pagoda was built above a small hill in the river bank. Its entrance gate was facing the river. Beside the regular cab, tourists could reach this place with the boats cruising the Perfume River. The boats would terminate right across the pagoda. The pagoda was built somewhere in 1601. It had seven stories and was often considered as the tallest religious building in Vietnam. Behind the pagoda we found an entrance gate that would lead us to a huge complex comprising temples, mandarins, and some small museum where an old blue car was on display. You might wonder what’s so important about that car. We had to come closer to find the answer. Long before I came to Vietnam, I had been familiar with some pictures taken during the social turbulences in Vietnam during the wars. One of the most memorable pictures was the one showing a Buddhist monk sitting in a lotus position with flames burned him out to death. I knew he was protesting against the authority but I had no idea who he was and what he was against to. And I didn’t really notice that there was a car parked not far from him. Turned out that it was his car. The monk drove all the way from An Quang Pagoda to a busy intersection in Saigon (the old name of Ho Chi Minh City). He protested against the South Vietnam President, Ngo Dinh Diem with his policy of discriminating against Buddhists and violating religious freedom. At the back of the complex, we found a small pine forest with a tiny pagoda in the centre. It was so tranquil I thought it’s a perfect place to meditate. Before dark, we decided to left the pagoda. 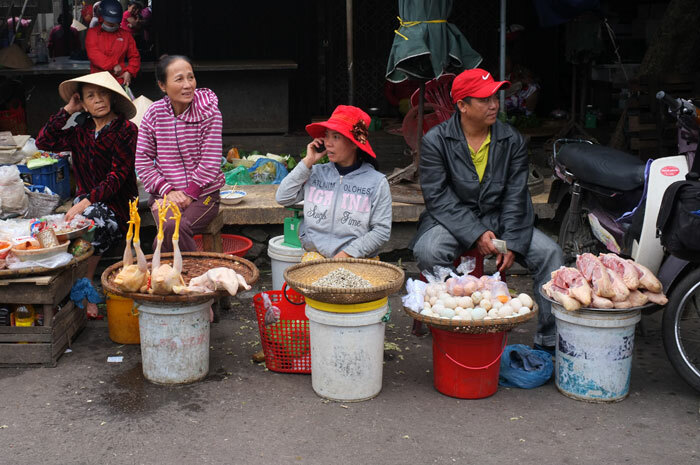 Before returning to the hotel, we stopped by at the traditional market of Dong Ba, not far from the Truong Tien Bridge. 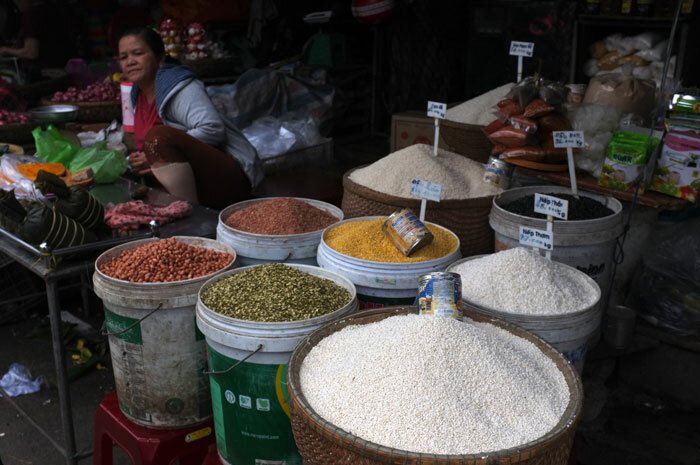 Well, it’s actually just like our Indonesian traditional market in common. We closed the trip of that day by having early dinner at local food stall selling Vietnamese chicken noodle soup. Then the rain began to fall. We thought it was normal considering that we were being in the north part of Vietnam, and it was still winter. But it wouldn’t stop until night. The following morning, we planned to see some old historical royal cemeteries in Hue. Most of them were out of the door. We really hoped the rain would stop that night, but it’s getting harder as we went to bed.